Aviation Updates Philippines – ​The Philippines' leading carrier, Cebu Pacific (PSE: CEB), is set to expand its route network from its hubs at Clark and Cebu this year, on the back of increasing demand from tourists for more direct and seamless connections. EXPANSION OF AIR ROUTES IN SECONDARY HUBS. Cebu Pacific's Chief Operations Officer, Michael Shau speaks about the airline expansion plans of the Philippines' largest low-cost carrier during the Routes Asia 2019 held in Cebu, Philippines from March 10 to 12, 2019. 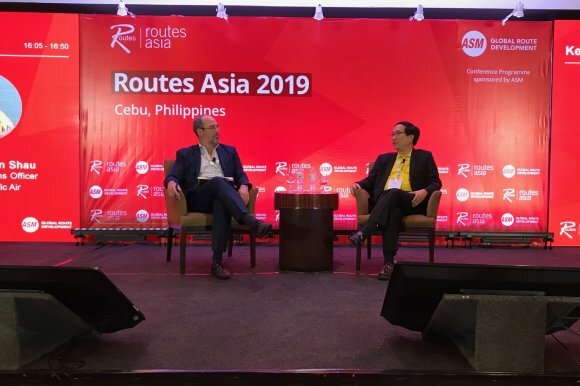 Speaking at the Routes Asia conference in Cebu, Michael Ivan Shau, Chief Operations Officer of Cebu Pacific, announced that the carrier will launch three new domestic routes from the Clark International Airport. CEB will mount daily flights between its hubs in Clark and Iloilo; as well as between Clark and Bacolod, starting August 9, 2019. Beginning October 9, 2019, CEB will mount daily flights between Clark and Puerto Princesa in Palawan. "There's still a lot of opportunity for expansion within the Philippines—inter-island connections from key cities like Clark and Cebu. We believe that there is a significant untapped market in northern provinces in the Philippines. Creating direct links between domestic destinations and our other hubs will spur tourism and movement of goods and investments, whilst doing away with having to pass through the main hub in Manila," Shau noted. The Clark International Airport has served as the hub for North and Central Luzon of Cebu Pacific for the past ten years. It has emerged as one of Asia's fastest-growing airports, with passenger volume breaching 2.5 million in 2018. Over the past six months, CEB has boosted frequency in Clark by over 75%, with direct connections to Cebu, Caticlan, Tagbilaran, Davao, Singapore, Macau and Hong Kong. "We are also in the final stages of launching a new route between Cebu and mainland China. We'll have more details on that soon," added Shau. Cebu Pacific had earlier stated they would ramp-up capacity in its Cebu hub by as much as 20% in 2019. Routes in development for its Cebu hub are focused on North Asia markets such as China, Korea, and Japan. "The Philippines is the closest tropical destination from North Asia. Cebu and the 166 islands within the province alone boast of some of the best tropical getaways in the world. It's a logical choice to be our 'beach hub' with easier access to world-class beaches, dive spots and resorts." From Cebu, CEB mounts direct flights to Bacolod, Caticlan (Boracay), Butuan, Cagayan de Oro, Calbayog, Camiguin, Clark, Davao, Dumaguete, General Santos, Iloilo, Kalibo, Legazpi, Ozamis, Pagadian, Puerto Princesa, Siargao, Surigao, Tacloban, Zamboanga, Hong Kong, Macau, Tokyo (Narita), Singapore and Incheon. Aside from its Clark and Cebu hubs, Cebu Pacific operates flights out of five other strategically placed hubs in the Philippines: Manila, Kalibo, Iloilo, Davao and Cagayan de Oro (Laguindingan). The carrier has maintained leadership in the domestic market with 37 destinations and over 2,130 weekly flights. Coupled with 26 international destinations, the entire Cebu Pacific network covers over 108 routes spanning Asia, Australia, the Middle East, and USA.